Cut a 1” hole in a piece of paper for each child. Place the hole on different surfaces, and describe what you see. E.g. your skin, wood grain, a hairbrush, buttons on a telephone etc. Look at the same areas with a magnifier. What looks different? ​Magnifiers help people see things they could not see without them. Compare looking at an object with a magnifier very closely. Now further away. Is there a difference it what and how you see? 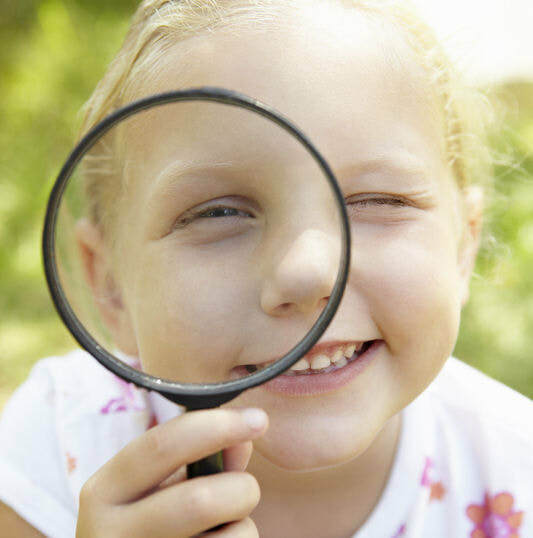 Compare looking at the same object with different kinds of magnifiers.